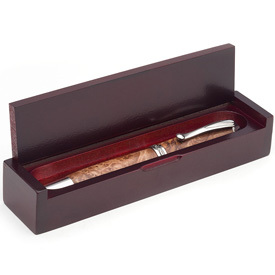 Designed to hold oversized pens up to 3/4" diameter, the Artisan® Havana Pen Box gives your pens the presentation they deserve. Fits oversized pens up to 3/4" dia. Comments On Feb 10, 2018:We use this box for almost all of our fountain pens. They add an extra touch of class and fit most pens. Jr. Gentlemens fit wonderfully in them. They are of sturdy construction and the fit and finish is good. Great price as well-especially if you buy in bulk. Comments On Jan 09, 2017:This is a very nice pen box and available at a good price. Beware however, since it won't hold a very large pen (such as a PSI Majestic). Artisan Havanna Pen Boxes are Great. Comments On Nov 09, 2013:I needed a nice looking, large wooden pen box to hold my fuller sized, higher end pens. Boxes I have purchased from other suppliers were just not big enough or looked good enough for the larger pens I make. I bought some of these boxes and my larger pens fit perfectly. There is plenty of room for the larger, higher end pens and I would highly recommend them. Great product.